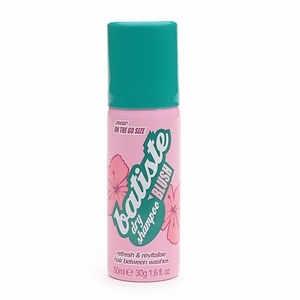 This is Batiste Dry Shampoo. It is, in a word, fabulous. I was one of those people that would wash my hair every day. I felt icky if I didn’t. However, that habit had a few problems. It was time consuming to wash, dry, and flat iron my hair every day (not to mention damaging), and the continual washing was stripping the color out of my hair quickly. Enter dry shampoo. Yep, the old school stuff that your mom may have used. The first one I tried wasn’t cheap, and while it did take the grease out of my hair, it also left a lovely white residue in my dark hair, thus making me look like I had a gray sheen on my roots. As I spend good money making sure my roots are NOT gray, this was not really what I was going for. Before I tried a different brand, I did a little online research, and hit upon this product. Voila! Grease be gone, and no white residue. Smells great, too, although I believe the original version is unscented if you prefer. I now can get away with washing my hair once every three days or so, and let me tell you – TIME SAVER! I can now spend time on more important things….like blog posts….. Available at Ulta as well as a number of online retailers.